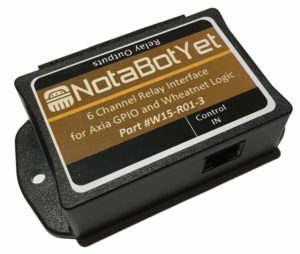 Purpose: The 6 Channel 5V Relay Interface from NotaBotYet was designed to provide an easy to install relay interface controlled by the six open collector outputs of a standard GPIO port on a Wheatnet-IP logic port. 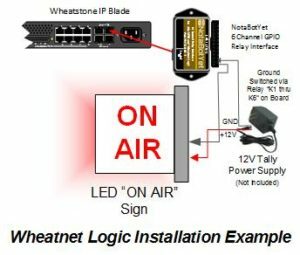 The outputs of the Wheatnet-IP logic port are designed to support a nominal current of 50 milliamps. This is typically just enough current to control only a couple of typical LEDs. The onboard relays of the 6 Channel Interface will allow these six outputs to control external devices requiring more current… up to 500 milliamps. 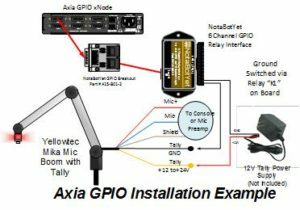 This is more than enough to control various multi-LED tally lights on microphone booms, modern low voltage LED “ON AIR” lights, or any other device requiring isolated dry-contact switching up to 500 milliamps. 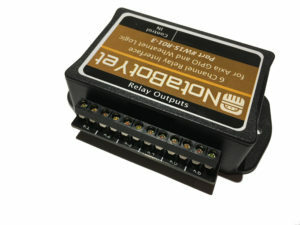 The six relays are “Form A” type reed relays and the output connections are all isolated from each other to allow each output to switch different voltage levels or signals. This device also works with the NotaBotYet Axia GPIO Breakout Board Part #A15-B01-2 (although only 5 of the relays are controllable). The coils of the relays are powered by +5v present on the Wheatnet-IP logic port or the Axia GPIO port meaning the device does not require an external power supply to operate the relays. However, external power may be required to operate whatever the relay outputs are being used to control. Inputs: Inputs are available on a co nvenient RJ45 connector allowing the use of standard Category 5/6 wiring to transport Logic and GPIO control within your plant. Inputs are designed so that a standard Ethernet type cabling with straight-through wiring can be used to connect the 6 Channel 5V Relay Breakout directly to the logic output connector of a Wheatstone® Blade or the output connector of the NotaBotYet Axia GPIO Breakout Board Part #A15-B01-2. The inputs can also be used with any other type of 5V logic switching such as computer GPIO logic cards or other +5V based GPIO control signals. However care must be taken to limit the supply voltage to +5V since exceeding this can destroy the relay trigger coils. Mounting: The devices is packaged in an easy to mount ABS Plastic case. This takes up a minimum of space in the plant and allows the end user to employ a variety of mounting schemes based on their needs. Mounting screws are included. Other types of screws and mounting may be used as well, per the creativity of the end user. Other types of screws and mounting may be used as well but must be supplied by the end user.